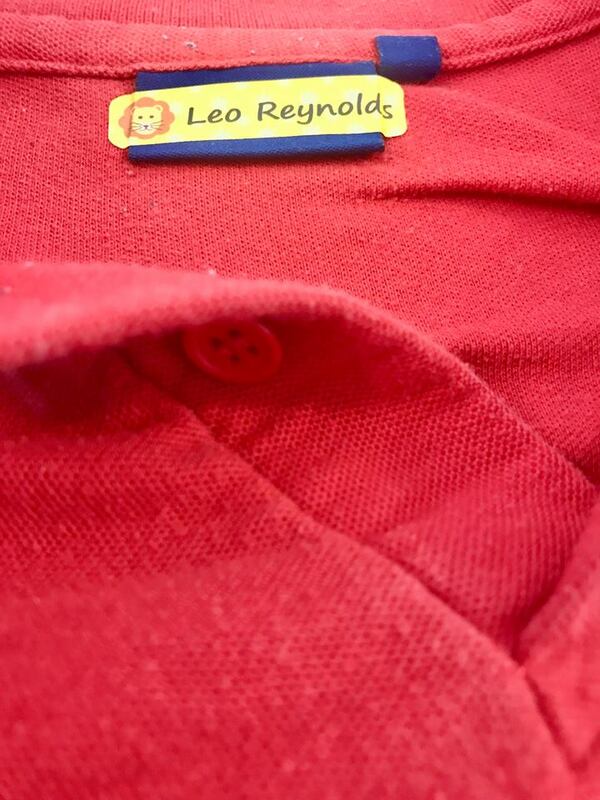 When Leo started his new school back in May last year he had three school jumpers. Want to know how many he has now not even 12 months later? One. He has one school jumper. There seems to be a black hole in that school from which school uniforms can never return but Leo losing most of his school uniform is partly my fault too. I didn’t label them. I did scrawl his name onto the label with pen but obviously not well enough to survive the multiple washes they had to endure. Once Leo took his jumper off at school it was only going to be a matter of time before they got lost or taken home by someone else by mistake. Luckily for me, Stikets got in touch to ask if I would review their personalised iron-on labels. It looks like I can save Leo’s last school jumper from the school uniform eating black hole after all! 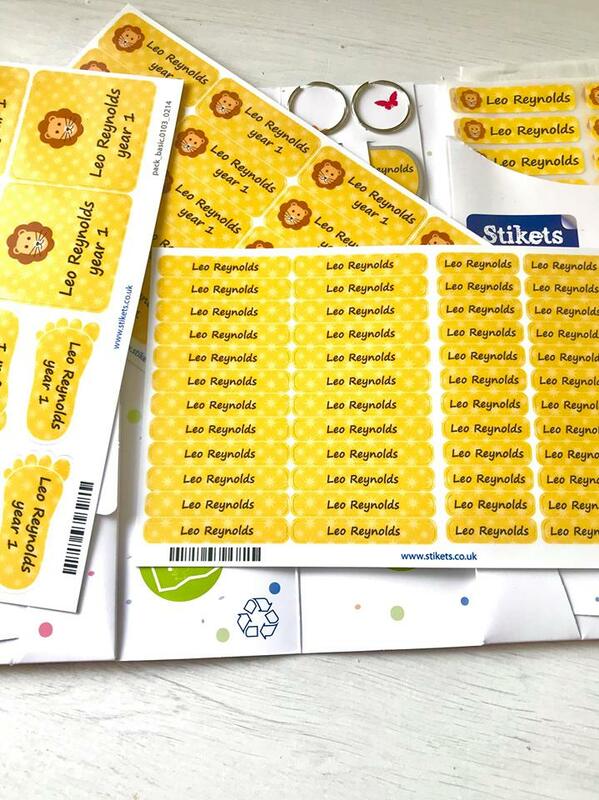 Here is my review of the Stikets labels, they are easy to use, completely customisable and can handle as many trips through the washing machine as your little ones uniform can. Stick around to the end of the post for your chance to WIN your own pack of Stikets labels. The Stikets basic value pack costs £19.95 and you get so much for your money. The labels can be fully customised using the Stiketss website. 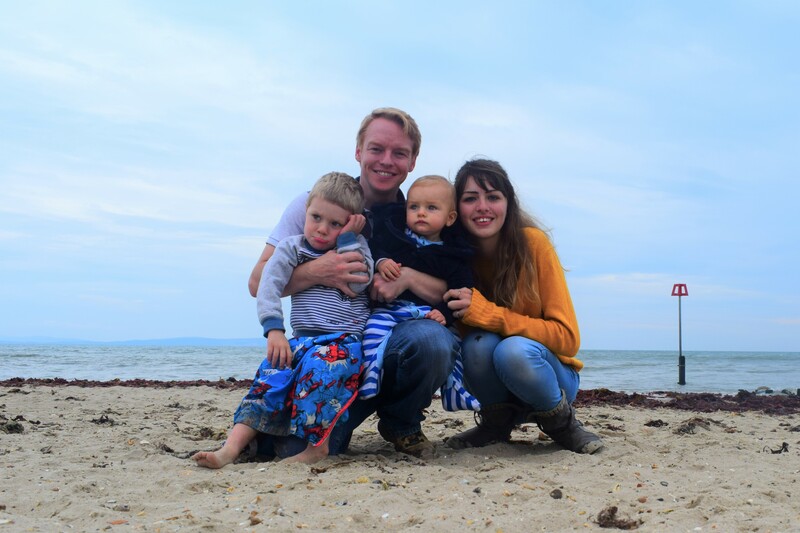 You can choose from several fonts, background colours and patterns and can even select a little character icon to put next to your child’s name on the labels. 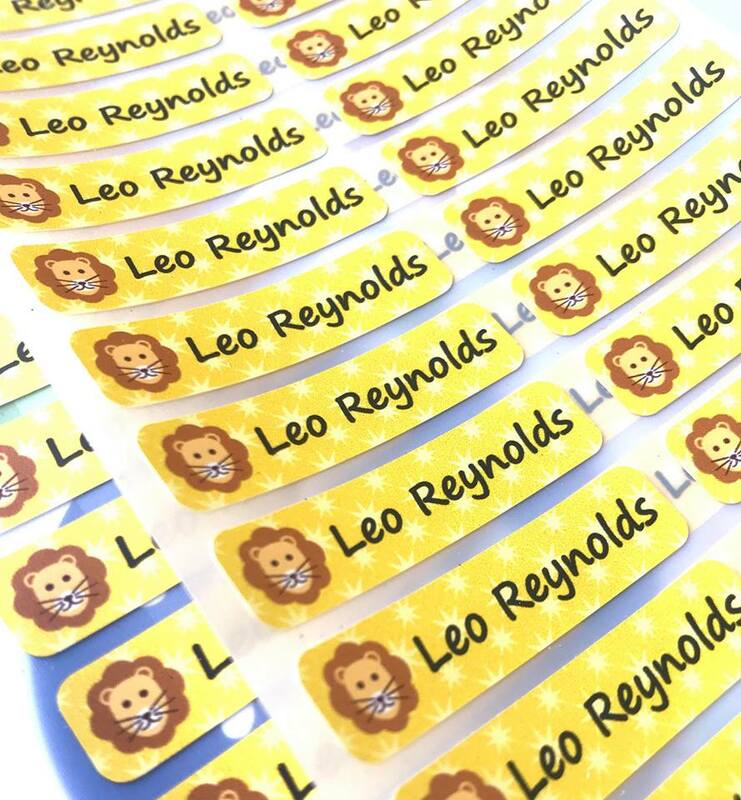 I went for a bright yellow with pale yellow stars in the background and chose the lion face as we call Leo Leo The Lion. 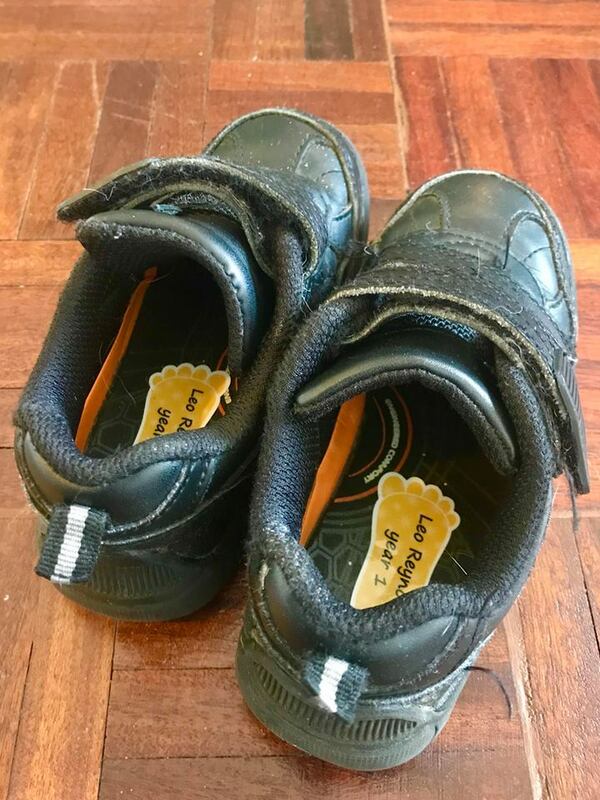 The name stickers and shoe labels are just basic adhesive stickers and really easy to use. 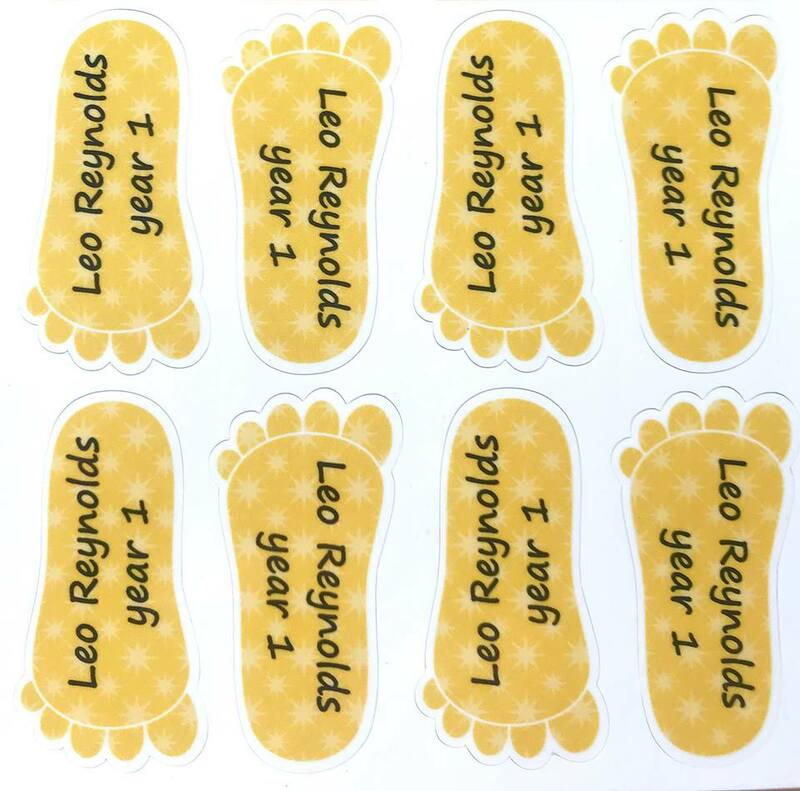 I have put one on Leo’s homework book, reading record and put the little feet stickers into his school shoes. Even for children who can’t read their own name yet, these labels are great as they can recognise the colours/characters when looking for their shoes or uniform after P.E, for example. 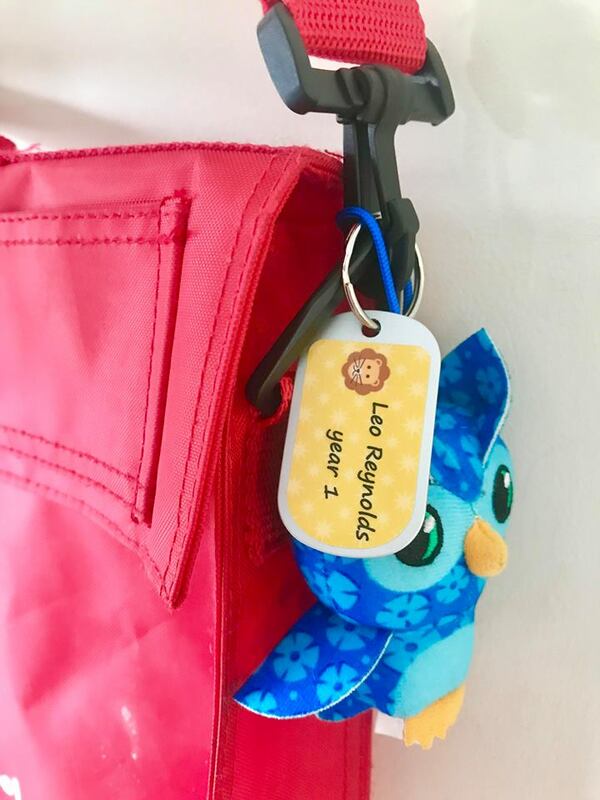 The luggage tags are great for book bags and P.E bags and fabric lunchboxes. There have been a couple of times Leo has come home with the wrong bookbag so I am hoping he will always remember to pick up his own from now on, you can’t exactly miss that bright yellow tag. The Iron-on labels are really quick and easy to use. You simply peel the label from it’s backing, place it on the label in the clothes and pop the parchment paper provided over the top of it. 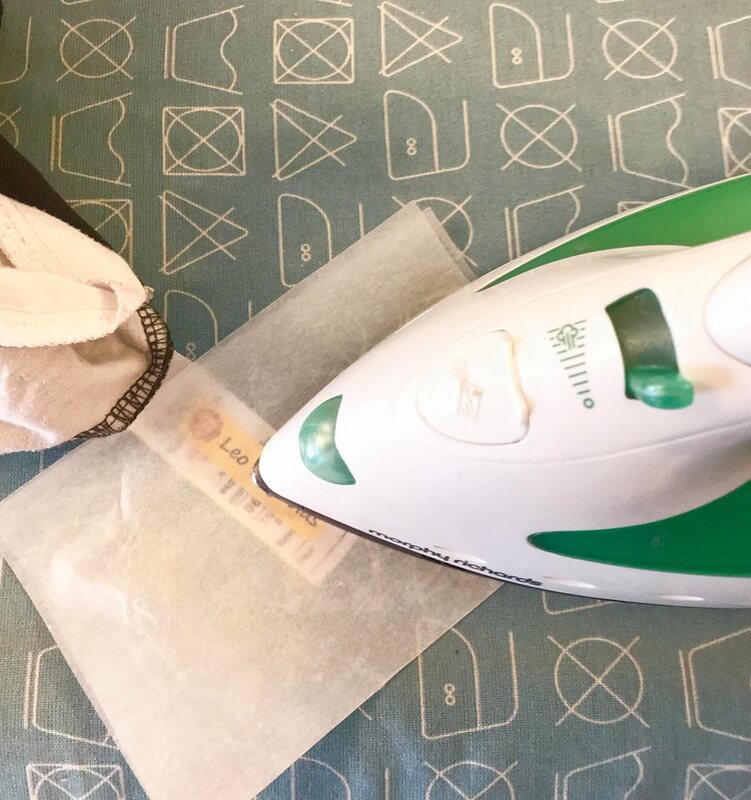 With your iron set to full and the steam setting turned off, you simply need to press hard and move the iron around for ten seconds or so and you’re done! It really is that easy. The labels are stuck in place immediately and I can already tell they are going to stay firmly in place for a long time to come. Of course, the real test will be to see how they survive the washing machine but I am confident they are not going to peel at the edges and fall off, they are seriously stuck on. 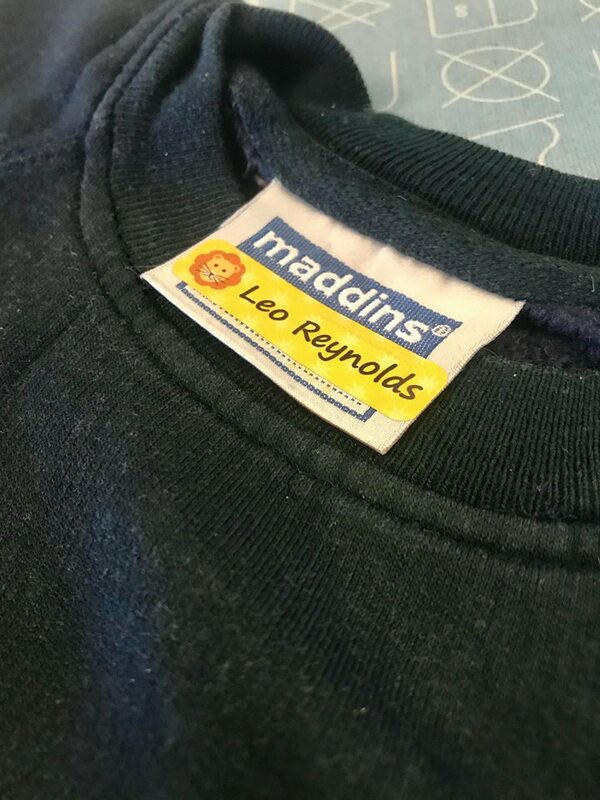 I would have liked the iron on labels to come in a variety of sizes like the adhesive name stickers as I did struggle to get the labels to fit onto the small space in Leo’s school T-shirts. They were the perfect size for his trousers and jumper though and I guess I could have always cut a little bit off either side to make them fit perfectly on his T-shirt labels too. 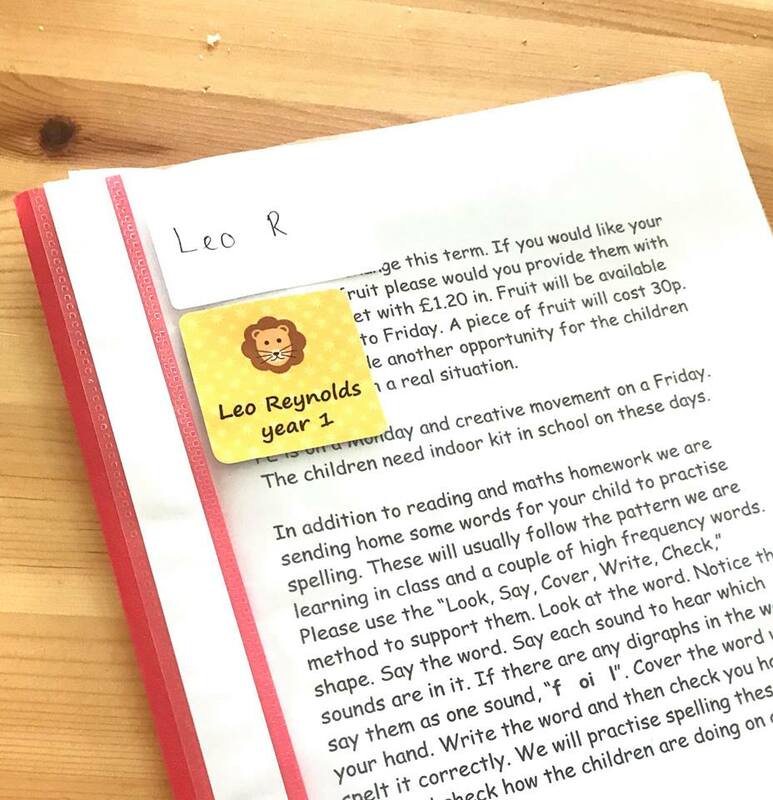 I am really impressed with the Stikets labels and I am definitely going to be using them on every school uniform I buy from now on. I wish I had used them sooner and maybe then we wouldn’t be trying to get through the week with just one school jumper. The fact that the Stikets labels are resistant to the washing machine and tumble dryer is brilliant, no one wants to spend money just for the labels to fall off after a couple of washes. I highly recommend Stikets if you have a little one starting school or nursery and you want to keep their uniform safe from getting lost. Like the sound of Stikets? 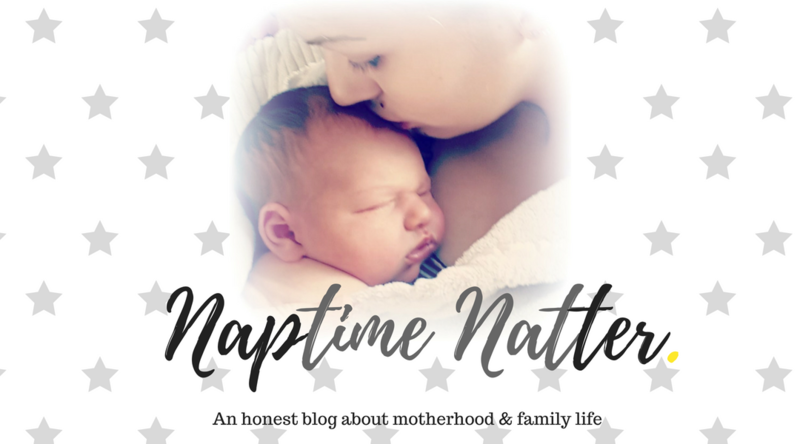 Now is the time to win your very own value pack of Stikets labels, just like the one I received for this review. Just enter using the rafflecopter below. The giveaway will be open until February 16th 2019 and the winner will be sent a voucher code to claim their pack of Stikets for free! Never lose a piece of school uniform again, enter below for your chance to win. Good luck! Disclaimer: This post is written in collaboration with Stikets. I received a value pack of Stikets lables in return for this honest review. That value pack sounds brilliant. I love how there’s also stickers for shoes and tags for bags. It’s so easy for children to mix up each others things in school if they’re not labelled. And it sounds like this company has everything covered! I’ve not heard of this company before but swear by personalised labels. They make life so much easier and saves things disappearing! I need some of these for my husband who’s a runner and goes to lots of runner/charity meet ups for motor neurone disease association – he’s always losing his stuff which gets v expensive. 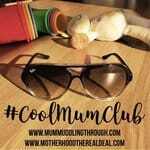 I need some of these for my husband – he’s a runner and is alway going to charity meet ups for Motor neurone disease – he’s always losing his stuff which as you say gets expensive. These are so bright and colourful and easy too. I use the sew on labels but will definitely be checking these out now. My little one has at least 20 pieces of school clothing and that’s not including underwear, shoes, plimsolls and sundries that also need labelling. The labels would be so handy for all of her school gear. I’ve no idea! I have 5 kids so trying to keep track on how many items they have is difficult. 15 not including socks and pe kit! With PE, Football, Forrest school, coat,book bag and all footwear and his normal uniform, my son has at least 40 items that need labelling for school. We have a set like this, and they’re an absolute life saver. Love that I can iron them on instead of sewing. And the shoe labels are genius! Especially when all kids school shoes look the same. My children must have at least 25 pieces between them! Indoor PE kit, outdoor PE Kit, pumps, trainers, shoes….,It goes on and on! Loads! 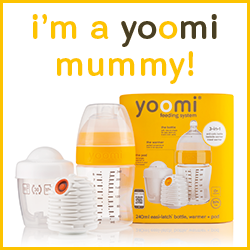 We have a large stock of it and still manage to run out some days! Need to keep on top of the washing and make sure they put it in the basket! Oòooo at least 17 pieces each ! Never actually counted them ! 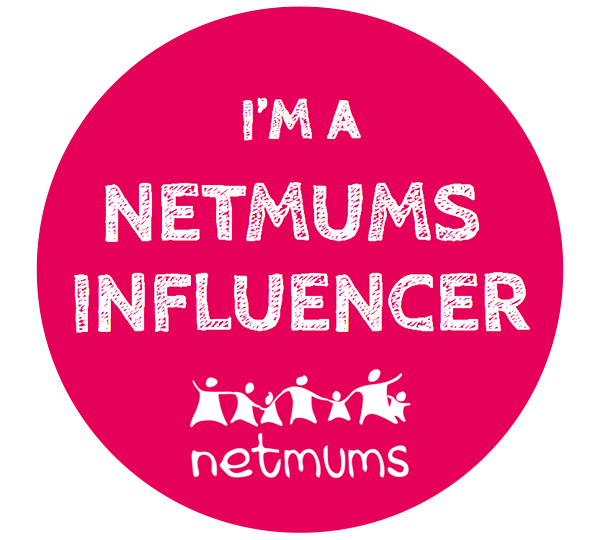 This is such a good giveaway! I really like the ones you put in the shoes, brilliant idea. I’ve never counted her school uniform! I think she has two skirts, 5 shirts, 4 jumpers, 2 ties, and her P.E kit! She has about 18 usually 3 of each item including PE kit. 15 not including socks and shoes. 3 shirts, 3 sweaters, 3 trousers, 1 coat, school bag, pe shorts, pe socks and 2 pe tops. Then there is the lunch box, water bottle and pencil case with pens etc oh and of course a PE drawstring bag. too many lol…. jumpers are often lost! These would be perfect for my grandson! Two jumpers, three shirts, two pairs & trousers, school shoes, plimsolls, trainers, shorts, t-shirt, tracksuit, and swimming stuff! Wow, its a lot when you count them up. Not sure of the number, he has lots of school trousers, a couple of tops and one jumper! This is very helpful for moms to put have identification to their kid’s things. It works not only for kids but for adults also.